Meet the indie chefs who don't need restaurants or food trucks — and instead bring pop-up kitchens to bars, festivals, and street corners throughout the Bay Area. Bert Johnson Ippo Ramen's Steven Yee. In recent years, the East Bay has experienced a surge in the number of food trucks, which offer entrepreneurs lower start-up costs and more freedom than brick-and-mortar restaurants. Some chefs, however, have moved even further away from conventional food businesses by launching pop-up kitchens at bars, galleries, festivals, and street corners throughout the Bay Area. The pop-up owners avoid the hassles that even food trucks can present and instead prep dishes at home and rely on very little equipment. The pop-up model gives young entrepreneurs and hobbyist chefs a low-risk opportunity to serve up their favorite dishes — offering up authentic plates in Oakland and Berkeley that you could easily find on a street corner halfway around the world. Here are some of the tastiest. When Alina Vongsamart tried selling authentic Southeast Asian dishes out of a food truck in Berkeley a few years ago, it felt too formal — a departure from the street food vendors she had seen in Laos and Thailand. "I just like keeping it simple and down-to-earth," she said. These days, passersby can watch her prepare handmade spring rolls outside the art gallery and retail shop Mary Weather (333 15th St., Oakland) and the Legionnaire Saloon (2272 Telegraph Ave., Oakland) — just two of the locations that host her mobile, truck-free kitchen. Her most popular dishes are fried coconut shrimp combo plates with rice and papaya salad ($7-$12) and fried banana spring rolls ($3) — the kinds of dishes her mother would cook when she was growing up. Ramen may seem like a tough dish to prep without an actual kitchen — but Steven Yee, the chef who runs the pop-up Ippo Ramen, has refined the art of serving up fresh and filling bowls of ramen at any location. 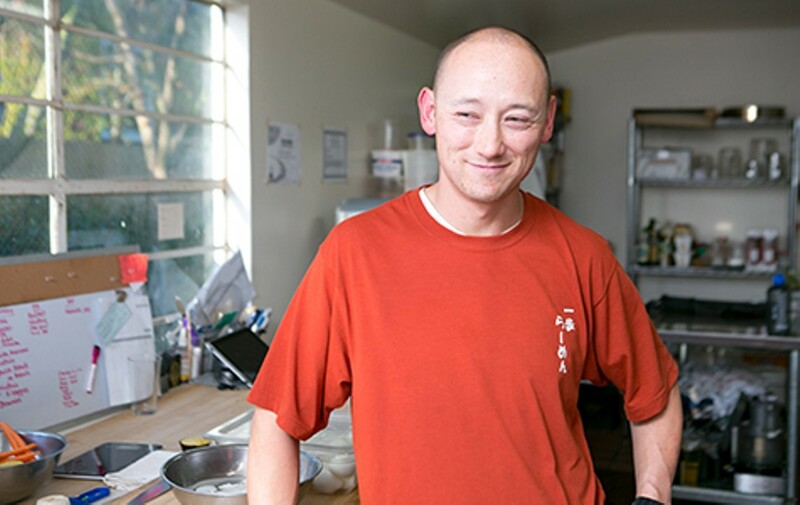 Motivated by his wife's complaints that they couldn't find any good ramen in the East Bay, Yee started cooking ramen bowls for her several years ago at home, and in 2012, he decided to launch his pop-up at Linden Street Brewery (95 Linden St., Oakland). 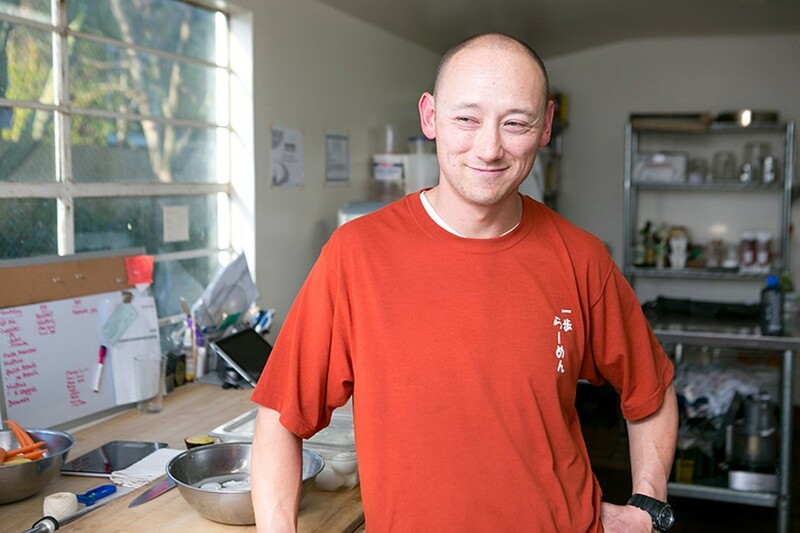 Now, he also serves his $9 bowls of miso ramen and shoyu ramen at Tokyo Fish Market (1220 San Pablo Ave., Berkeley). Yee said that after working as a line cook at a San Francisco bar and restaurant, he's been happy to interact directly with customers. "I spent years behind a wall in the kitchen putting food out and watching runners take it out," he said. "With pop-ups, I am in the eaters' environment." If you want to brighten up the worst day of the week, the Legionnaire Saloon's Motown on Mondays is probably the best party you'll find — and one of its biggest draws is the chef on the sidewalk outside the bar. Perla Yasmeen Melendez (full disclosure: a friend of mine) serves up a rotation of homemade enchiladas, quesadillas, and tamales ($7, or $10 with rice and beans) plus a complimentary drink, like jamaica (hibiscus iced tea). Two Mamacitas Pop-Up Kitchen offers a bargain that's hard to resist — especially considering the high-quality ingredients, such as those in Melendez's homemade salsa. Melendez said that since she launched her pop-up at Two Mammas' Vegan Kitchen in the Fruitvale district (3700 E. 12th St., Oakland), the concept has given her the opportunity to run her own independent business — one that always sells out in a crowd of Monday night drinkers. While pop-ups are an ideal model for first-time entrepreneurs, they also give experienced chefs a chance to keep cooking when a restaurant is no longer viable. Such is the case with Douglas Leong, who formerly ran Uncle Dougie's sandwich shops in Oakland and Berkeley — and now sells East Coast-style sandwiches outside the Layover (1517 Franklin St., Oakland) on weekends. To Leong, "pop-up" is a fancy way of describing the kind of street stands that are common in New York City where he previously lived. Uncle Dougie's $5 sandwiches — including his popular spicy pork meatball and chicken parmesan — are easy for him to prep on the spot and allow him to continue serving up his favorite foods even after he closed his businesses. Alfonso Dominguez, co-owner of Tamarindo Antojeria Mexicana restaurant (468 8th St., Oakland), wanted to model his street food operation after the vendors in Mexico — no big food trucks, just casual carts. With a background in architecture, Dominguez decided to construct a three-wheeled bike cart — which turned out to be the easy part. It was quite an ordeal, he said, to convince county health officials to issue a permit for a food bike, but eventually he got the green light and since 2012 has been serving tacos, tamales, burritos, and other dishes ($2-$8) at pop-up events throughout the region. Born and raised in the Philippines, husband and wife Jay and Claudine Dava decided in 2011 that they wanted to bring Filipino street food to the Bay Area — especially their favorite pork barbecue skewers. Since then, Antonik's BBQ — a pop-up named after their two children Anton and Nikki — has served pork skewers, pork and chicken rice plates, barbecue sandwiches, and lumpia rice plates throughout the region ($4-$10). The pop-up now offers its authentic bites at Oakland First Fridays (Telegraph Avenue, Grand Avenue to 27th Street, Oakland), Alameda Point Antiques Faire (2900 Navy Way, Alameda), and many other local events.